CNN's Nic Robertson on the purported voice of Saddam mourning his slain sons. AMMAN, Jordan (CNN) -- Saddam Hussein's two eldest daughters arrived in Jordan in recent days as guests of King Abdullah, the Jordanian information minister said Thursday. The women, Raghad, 35, and Rana, 33, brought with them their nine children and were at an undisclosed location in Amman. The two sisters sought and were granted government sanctuary, a source close to the sisters said. Saddam has a third daughter, Hala. Information Minister Nabil Sharif said the kingdom "carried out this move purely on humanitarian reasons." "They are the guests of the country and the guests of his majesty," he said. "Being guests, they are welcome to stay, they are welcome to move on. But my impression is that they are in Jordan to stay." Saddam had five children with his first wife, Sajida Khairallah Telfah. Their sons, Uday and Qusay, were killed by American forces in a July 22 shootout. Neither Raghad nor Rana were being sought by American forces, who do not believe they are likely to know the whereabouts of their father. They have been estranged from their father for some time. 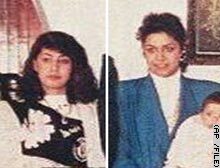 In 1995, they defected to Jordan with their husbands -- Hussein and Saddam Kamal. From Jordan, the brothers called for a revolution, and Saddam Kamal revealed Iraqi weapons secrets to U.S., British and Jordanian officials. Six months later, their father-in-law lured them back to Iraq with promises of forgiveness. After they arrived, however, they were killed in a 13-hour shootout at a house near Baghdad that is believed to have been organized by Uday and Qusay at their father's request. Since then, Saddam's widowed daughters had been held under virtual house arrest in Iraq. Last month, Izzi-Din Mohammed Hassen al-Majid, a cousin of the deposed dictator, told the London-based Arabic newspaper Asharq al-Awsat that the women and their families had been living in two rooms of a family safe house in Baghdad since the collapse of their father's regime. Al-Majid said he planned to lobby Britain's Home Office to grant asylum to the women, but a spokeswoman for the agency said the British government would "not consider claims from any member of his family who may have been involved in human rights abuses -- this includes Saddam Hussein's daughters." A Home Office spokeswoman told CNN on June 5 the daughters had made no formal request for asylum. Saddam's third daughter, Hala, was considered his favorite. In home videos shot during the early 1970s, he can be seen doting over her. Hala is married to Gen. Jamal Mustafa Abdallah Sultan al-Tikriti, who surrendered to U.S. forces May 17. He was No. 10 on the coalition's list of 55 most-wanted Iraqis . Some accounts report that Saddam had a third son, Ali, born in the 1980s to his second wife, Samira Shabandar, and he is believed to be in Switzerland. Time magazine reported this week that a former family butler said no such person exists, although one of Saddam's nephews is named Ali. The butler told Time the young man often mistaken for Saddam's son is actually Samira's 20-year-old grandson, Saif. Saddam's first two wives also are believed to be in hiding. The U.S. military is distributing six retouched photos of Saddam to coalition troops to depict what he might look like now, the Pentagon said Thursday. Some photos show him with long hair, others with gray hair and some with a mustache. The United States will pay a $30 million reward to the man who led U.S. forces to Uday and Qusay, State Department spokesman Richard Boucher said Thursday. There is a $25 million bounty for Saddam. Lt. Gen. Ricardo Sanchez, commander of coalition troops in Iraq, said Thursday that U.S. forces are targeting criminals, loyalists of Saddam's regime, Fedayeen Saddam militants and other radical elements.